Oaxaca, Mexico is one of Mexico's Mecca's for textiles and pottery. Chris Autio, a world adventurer and traveler, documents the ancient techniques of the Quilters Potters of Oaxaca. 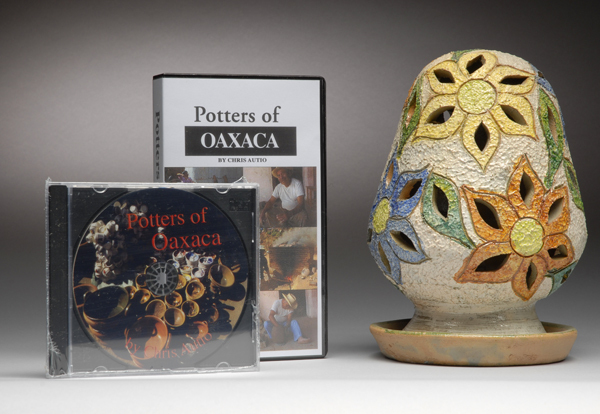 An Educational DVD showing artesanos working in all aspects of pottery production: clay excavation, sifting, mixing, wedging, coiling, carving, decorating, firing, and sales. While each family uses age-old production techniques, their designs continue to evolve and remain fresh. (Only available in DVD format.) Approximately 45 minutes.